Why Sail a Solo at Littleton? Littleton is a great club for Solo fleet racing. At many clubs an individual class start is something members only dream of, but at Littleton Solo on Solo racing is a regular part of the club sailing calendar. The depth of the fleet means that you will find good competitive racing whatever level you are currently at, be it new to sailing (or new to the Solo), or an experienced campaigner. Although the Solo is not particularly fast, it is a tactically challenging boat, and the nip and tuck of racing on our lake is addictive. Of course if racing is not your thing then the Solo also makes an ideal boat for a relaxing afternoon cruise in the sunshine. Getting some practice in ready for our Solo Open meeting on Sunday April 2nd. The Solo is a single handed dinghy ideally suitable for sailors between 70 and 95 Kg (thats between 11 and 15 stone in old money..) It has such a wide weight range due to the different mast options available, with bendy rigs available for the lighter sailors and stiffer rigs for the heavier. The boat was designed by Jack Holt in 1956, which sounds like a long time ago – but the design was visionary back then. It has fully battened (powerful) sails, traveller, easy to use control lines, centre main, stayed mast, and comfortable (and easily adjustable) hiking. There is lots of information on the Class Association website about the boat if you want to find out more. The majority of new solos are now built in an FRP construction, though composite and traditional wooden boats are also widely available from a number of suppliers. In the UK alone there are about 100 new Solos built every year. There is also a strong second hand market for the boats, so you don’t lose much money in devaluation when you sail a Solo. If you would like to see a little piece of history, then take a look at this Marketing Brochure for the Solo circa 1965. 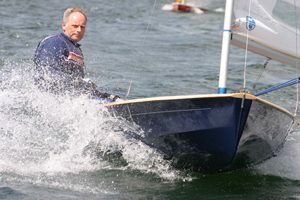 The class captain Paul Hurn, would be delighted to answer any questions you may have about sailing Solo’s at Littleton. You would also be welcome to visit the club by prior arrangement.